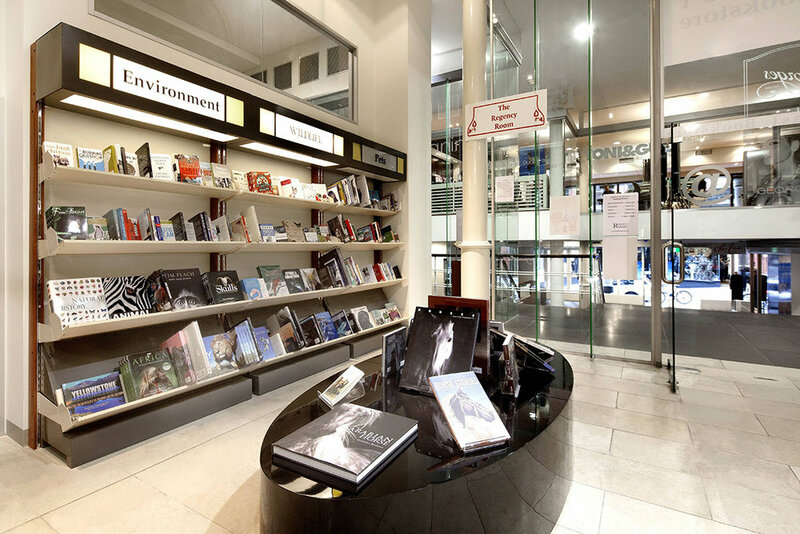 In July 2011, Mary Dalmau approached Guymer Bailey Architects to assist in the reopening of her iconic Melbourne bookstore, Reader’s Feast. After more than 20 years of selling books on the corner of Bourke and Swanston Streets, Mary bought the company, and with our help began looking for the Reader’s Feast’s new home. After inspecting more than twenty properties in Melbourne’s CBD, Mary chose the former Georges Department Store located on Collins Street as the home for the new store. Originally built in the 1880’s, the building had several refits in the 1990’s, and boasted original features like ornate columns and large windows, as well as desirable modern elements including an elevated glass void. With a strong desire to reuse or repurpose as much of the furniture from the existing store as possible, Mary’s brother Rick, of Dalmau Designs Pty Ltd, designed (in collaboration with us) unique, mobile shelving units which were documented, manufactured and supplied to provide the new space with added flexibility. To meet the challenging Christmas deadline, we produced photo-realistic renders, documented the renovation works and collaborated with the project team to ensure a successful reopening in December, where a huge crowd of devoted book readers celebrated the resurrection of Reader’s Feast.